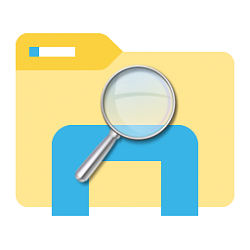 The Search Box in File Explorer allows you to find and view all your files and folders in one place. As you type in the Search Box, a simple search through the index begins to match your typed text with folder names, files names, the contents of files, and file properties. It will then display the search results in File Explorer. You can also perform an advanced search using Search Tools from the ribbon to find files or folders by date (taken, modified, or created), folder path, kind, name, rating, size, property tags, and/or type. This tutorial will show you how to use the Search Box in File Explorer to perform a simple and advanced search for your files and folders in Windows 10. 1. Open the folder, drive, or network location you want to search within in File Explorer (Win+E). This PC Search this pc. Current folder Search only in the selected folder, and not in any subfolders. All subfolders Search in the selected folder and all of its subfolders. If you like, you can select a recent search from your search history to use instead. 5. If you like, you can now perform an advanced search by using any of the Search Tools below to refine your search results.